While not a common menopause or postmenopause symptom, experiencing tingling extremities can be unsettling and unpleasant. This tingling can affect any part of the body, though it commonly occurs in the feet, legs, arms, and hands. Tingling extremities during menopause are usually the result of hormone fluctuations. Fortunately, most cases of tingling extremities during menopause and postmenopause do not indicate a more serious underlying condition. Nonetheless, women who are experiencing tingling extremities and those who are curious about this menopause symptom should learn more about its causes and treatments. 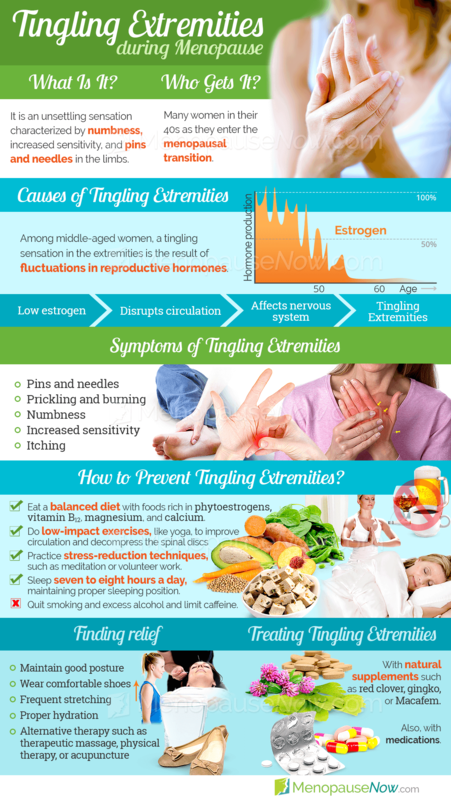 Continue reading to learn more about tingling extremities during menopause. Tingling extremities, medically referred to as paresthesia, can occur at any time. In milder cases, tingling can arise after a certain position or posture pinches a nerve or presses on an artery, causing a limb to temporarily "fall asleep." In these cases, the tingling extremities usually return to normal shortly after the compression is relieved. Along the same lines as paresthesia, a low number of women in menopause also report experiencing formication, or the sensation of insects crawling on the skin. This is akin to a “creepy-crawly” sensation, even though nothing is there on the surface of the skin. While tingling extremities are not usually cause for concern, these sensations can be indicative of another condition. Read on to learn more about the causes of tingling extremities. Although most people assume that all tingling and numbness sensations are caused by extremities falling asleep, that is a false assumption. There can actually be a number of different and varied causes behind this sensation, and some of them are entirely unrelated to blood circulation. In most cases, tingling extremities experienced during menopause are the result of natural hormone fluctuations. Estrogen, one of the primary hormones in flux during menopause, has a complex effect on the central nervous system. When this hormone is thrown off balance during menopause, it can affect the nervous system, producing symptoms like tingling extremities. While estrogen fluctuations are a prime cause of tingling extremities during menopause, other medical conditions can trigger tingling in the hands, feet, arms, and legs. Read on to discover when tingling extremities might warrant a trip to the doctor's office. If you've ever experienced tingling sensations in your face, then you know how confusing and irritating this symptom can be. Learn all about causes and solutions to tingling in the face here so you can finally have an arsenal of knowledge to tackle this symptom once and for all. While tingling extremities during menopause are not usually cause for alarm, there are some cases of tingling extremities where medical attention is necessary. If you experience any other unexplained symptoms along with tingling extremities - such as increased urination, worsening of symptoms while walking, rash, muscle spasms, or pain - it is wise to seek medical help. Because most cases of tingling extremities in menopause do not require medical attention, it can be important for women to learn more about the management options available. Please read on to learn about the treatment of tingling extremities during menopause and postmenopause. When your extremities are tingling, it can be difficult to separate normal sensations from the tingling. This makes it more likely that you may damage your hands, feet, or legs. Be sure to pay extra attention to protect your extremities from bumps, cuts, bruises, and burns. As with any menopause symptom, it is usually wise to begin with the least aggressive tingling extremities treatment and move on to the next method only if relief is not achieved. In most cases, a combination of lifestyle changes and natural therapies is the most effective and safest approach to managing tingling extremities during menopause. A good, balanced diet, hydration, and adequate sleep are basic lifestyle measures that can help. A doctor can also recommend other changes that can help to ease tingling extremities. Using certain alternative treatments can also help to get to the source of tingling extremities in menopause: hormonal imbalance. Most experts recommend that women who suffer from tingling extremities and wish to treat the symptom begin with lifestyle changes, then move onto alternative medicine and finally, look to medications or surgery if nothing else seems to work. Click on the following link to learn specific treatments for tingling extremities in these three categories. Many menopausal women are all too familiar with the hormonal upsets it creates. In many cases, it can manifest itself as a tingling in the extremities or other uncomfortable symptoms that disrupt a good night's rest. Learn about causes and treatment of tingling in hands and feet at night here. Tingling Tongue and Lips: What's Going On? 12/21/2018 Just when a woman thought she's experienced all menopause symptoms possible, she's struck with sensations of a tingling tongue and tingling in the lips. Continue reading to learn more about tingling tongue and tingling lips as well as what you can do to keep this and many more symptoms finally at bay. 03/17/2017 Tingling is the sensation of having pins and needles in the hands, legs, and feet. If left unchecked, this nighttime affliction can grow painful, eventually disrupting normal sleep patterns, triggering anxiety, and exacerbating mood swings and other symptoms. This article presents the main causes and signs of tingling at night. 07/18/2016 Tingling extremities can be suffered from at any stage during a woman's life, and are particularly common during times of hormonal imbalance. This article answers the most frequently asked questions about the symptom, including what causes it, what the symptoms are, whether it is serious, and what can be done to relieve it.